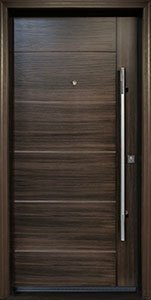 The Transitional collection of fibreglass doors are for those who value the timeless appearance of authentic wood in stain and appreciate contemporary linear designs. These doors create a truly elegant and remarkable entrance with a modern flavour. With our CNC machine we are able to create doors with custom shapes, sizes and style which successfully combine the simplicity of grooved lines and sophistication of stained wood grain surfaces.